Unlike today, in old times, fruit, vegetable and dried goods were not available throughout the year. Therefore, all foods and ingredients that are to be consumed during Ramadan had to be prepared during the seasons when they were available. 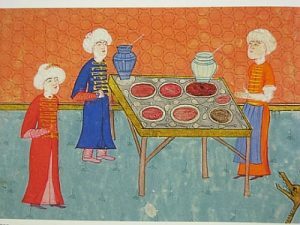 In Ottoman times, these foods that were bought or prepared ahead of time specifically for consumption during Ramadan were known as Ramazanlik. Such foods included pastirma, sucuk, kavruma and other meat products as well as dried green beans, vegetables (such as eggplants, tomatoes and red peppers) and various pickles, cheese and oils, preserves, marmalades and fruit leathers and also bulgur, noodles, rice, pasta and breads. Back then, it was important that such foods be bought or prepared in quantities sufficient to last at least a month. It was customary during Ottoman times, for those who were well-off to send Ramazanlik to their families, friends and neighbours. This custom of sending out Ramadan provisions is known as distributing Ramazanlik. Because foods are more readily available these days, the custom of Ramazanlik is not as widely practiced as it used to be. 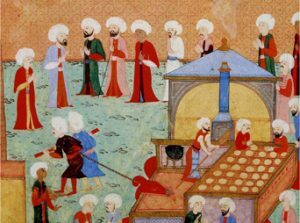 Today, instead of individuals, it is more likely that factory/business owners would distribute Ramazanlik to their employees and this is considered to be an extension of that old custom. The first meal of the day is eaten the latest possible before the break of dawn by those who intend to fast, known as Sahur in Turkish. While Sahur is not a religious requirement, it is highly recommended by the prophet as it helps in keeping the body nourished and energised during the fast. Since one will go back to sleep after sahur, the foods must be chosen with care. In addition to flavor and presentation, it is mandatory that sahur foods are healthy, full of nutrients, not too rich or salty as to not cause fatigue and thirst. “In Anatolia and Rumelia, the staples of the sahur meal were gözleme and börek. The women would knead the dough at night, and bring the gözleme and börek to the table freshly baked. In Istanbul, however, börek was not eaten for sahur; the sahur table contained kazandibi, çöreks, kashkaval cheese, neck meat and cold sliced tongue. While those were the traditional Suhour options in households during Ottoman times, nowadays most people would eat leftover Iftar food, or would prepare a variety of small dishes including cheeses, olives, jams… and have a quick meal before heading to bed. In Ottoman times as in more modern Turkey, the Iftar meal is very varied, yet consists of small quantities of these varieties. There is not any one dish that is the focus of the meal, as people would pick, bits and pieces from various plates. As before them, and today, the Ottomans too broke fast with dates, while at times with olives too. They then had a glass of sherbet and went to pray Al Maghrib. After the prayer, they would have a small variety of foods from which they would eat bits and pieces. Then once Taraweeh prayers were over, a bigger meal was served including desserts. Muslim Sufi Orders have always used twirling, music and poetry both to express their love of and to get closer to Allah. The twirling, repetitive recitations (of religious phrases such as the names of Allah, expressing gratitude…) and music are so captivating that they have become a form of art taught and practiced by many artists, including non-Muslims. The real Sufi Dervishes are taught by their spiritual mentors, and their practice is usually made to get closer to the Divine rather than a performance. Yet they have always captivated an audience. The Ottoman Sultans too would sit for a Sima, or a twirling performance by Dervishes. While Sufi dancers were much more popular in the past, a tradition held in many cities, especially in Countries like Egypt, Morocco, Palestine, Istanbul… they have been diminishing in the past decade, and not as commonly found. However, the tradition, the art and the soul of Sufism are all coming back to life. So much so, that festivals, such as the Fes Festival of World Spiritual Music, as well as the Sufi festival held in Turkey in April, and a few performances held in Abu Dhabi recently…. among others… are all reminders of this wonderful form of art. Cities like Beirut had brought Sufi dancers back to the Ramadan scene of activities last year, and Sufi dance performances continue to exist in Jordan’s Circassian community. Watch this video you will love it. In their performance of the Sima Dervishes perform a twirling as they believe it helps them transcend worldly attachments into the realm of the Divine. Sima is now performed in many areas of the world as a form of art, and to some even as a form of meditation! 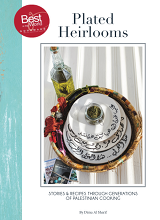 Hope you enjoyed getting to know the Foods and food traditions of Ramadan during Ottoman Times. Let me hear your thoughts, and let us know if your country has such foods that have become the food of choice for gifting and special occasions? While you are it, also let me know if you have ever watched a live Sufi performance? Did you know there are many different types of music, twirling and styles? which is your favourite? Leave a comment and help me keep the conversation alive.